In the low desert of southeast California, the north end of Imperial Valley was once a vast salt pan, 250 feet below sea level, and subject to periodic flooding from the Colorado River that flows by 70 miles east, on the far side of a range of barren mountains. 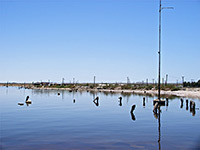 But following a particularly large flood in 1905 caused by collapse of a dike along the river south of Yuma, a breach not repaired until 1907, enough water had collected in the basin for the 35 by 15 mile lake - named the Salton Sea - to become permanent, since water lost by evaporation (up to 18% each year) is replenished by run-off from the surrounding hills. For many years at the start of the 20th century, the sea looked set to develop into one of the major leisure destinations in the state, as resorts were built and the lake became a popular location for sunbathing, swimming, boating, water skiing and fishing (after the introduction of several salt water species), though as the sea has no outlet channel, the water gradually became more saline and less inviting; besides the salty minerals leached from the hills, pollution from dissolved pesticides gradually built up, and much sewage washed into the lake from the south via the New and Alamo Rivers. Today, the lake is still quite striking and attractive from a distance, where the water appears deep blue, ringed by pure white beaches and flanked by the creviced hills of the Chocolate, Santa Rosa and Orocopia Mountains. Close up however, the scene is not so pretty. The water is actually dark brown in color and quite smelly, containing rotting vegetable matter and often sprinkled with dead fish floating on the surface. The beaches are composed not of clean sand but fish bones, crushed shells and deposited salt, and harbor huge numbers of flies. 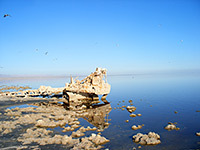 The natural rise and fall of the surface level over the years has resulted in a band of salt-encrusted land around the lake, marked by the remains of trees, bushes, fences and even houses, all gradually decaying in the caustic environment. 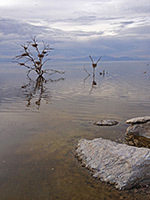 So although a few hardy people still swim in the Salton Sea, and the lakeshore towns are home to a population of several thousand, leisure activities are quite restricted - photography and bird watching are the main pursuits nowadays. 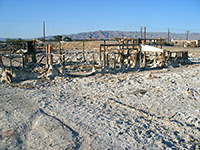 The Salton Basin is bordered by the Coachella Valley in the north and the larger, flatter Imperial Valley to the south. Main roads run along both the east and west shores (see map), with the eastern route (CA 111) generally closer to the water; the west highway (CA 86) is several miles away. The lake looks similar from all directions and there is no particular center for visitors. The majority of the shoreline is not easily accessible and most of the surrounding land is unused, though there are several small towns near the water, and various kinds of roads leading towards the shore. 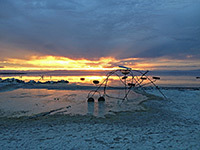 In the north, Highway 111 first approaches the sea at the small towns of Desert Beach and Salton, near which is one of several shoreline access points for the Salton Sea Recreation Area - a state-run park extending for 20 miles along the eastern shore. A fee of $6 per vehicle is charged, and several facilities are available (campsites, picnic areas, fishing piers, a boat ramp and a few short trails), though the place is not especially exciting nor very appealing. South of here, the road moves away from the shore after Bombay Beach, a small, rather forlorn settlement of a few hundred people - the edge of town was flooded during a period of high water and now lies abandoned in a field of salt and mud, on the far side of a protective dike about 15 feet tall. 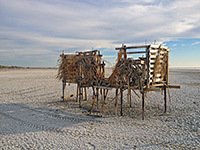 The rotting remains of several mobile homes and wooden dwellings are buried to depths of 6 feet or so, and the water's edge is lined with a variety of other derelict structures including an old crane, barely recognisable beneath its thick salt encrustations. Like many other parts of the sea, the far shoreline is sufficiently distant to be virtually out of sight, so the reflective waters merge with the (usually) cloudless sky to create an indistinct horizon and a completely blue landscape, all enveloped in a humid heat haze. The town has a welcome sign, a cafe and a shop, but no other facilities. South of Bombay Beach, the surroundings are mostly unbroken mudflats bearing no vegetation, becoming partly overgrown as the highway approaches the small town of Niland (just east of which are the free-living community of Slab City and the late Leonard Knight's Salvation Mountain). 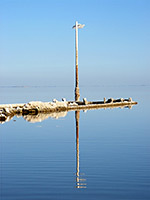 The southern shore of the Salton Sea is formed of irrigated, agricultural land and has little of interest to see, although much of this part of the lake is within the Salton Sea National Wildlife Refuge, an important resting place for migratory birds - over 400 species have been identified. This diversity is currently under threat due to the steadily increasing salinity, which is endangering the few species of fish that live here and so provide food for the birds. To the west, Highway 86 is separated from the lake by several miles of salt flats and sand dunes, with the first easy access at the sprawling residential town of Salton City, which has many roads and lots of palm trees though not that many houses, and few facilities. 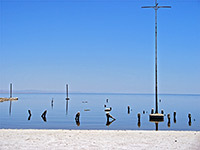 The land to the north is part of the Torres-Martinez Indian Reservation - the tribe traditionally owned much of the Salton Sink but lost most of their acreage after the 1905 flood. The smaller town of Salton Sea Beach offers a quick (and free) approach to the lake, via a short side road lined by houses that become less well kempt towards the shore, ending with several that are completely derelict. The water's edge here is typical of much of the lake, in the middle of stark, photogenic, white and blue scenery somewhat spoilt by the immediate surroundings, owing to the bad smell, dead fish, flies and litter. The next town northwards is Desert Shores, another sleepy place also with disused buildings and an abandoned shoreline (including the remains of a marina, though this is fenced off), after which the road moves away from the lake and on towards the much more upmarket surroundings of Indio.